As children have been getting back to school for fall, you may have started to notice some signs around school zones as you travel by in the mornings. According to officials with the Citrus County Sheriff’s Office, dozens of complaints have been received regarding drivers not slowing down when driving through school zones. Understand that failing to stop or travel at the posted speed limit could result in hefty fines ranging from $156 to $456. Furthermore, drivers will be cited for a mandatory court appearance if caught going more than 30 mph over the posted speed limit in a school zone. Drivers need to be alert at all times, especially when near school zones and along bus routes. Children can be unpredictable, so it is best to keep a look out for kids walking on sidewalks, in parking lots and crossing streets. The AAA estimates that 55 million children across the United States have returned to school this fall, so drivers need to be extra cautious before and after school hours. According to the National Highway Traffic Safety Administration, 42 percent of fatalities, the highest percentage of fatalities among pedestrians under 15, happen between 4p.m. and 8p.m. Moreover, while more than 23 million students nationwide ride on a school bus, the greatest risk to children is the time when they are approaching or leaving the bus. The danger zone for school buses is 10-feet in front of the bus, 10-feet behind and 10-feet on each side. 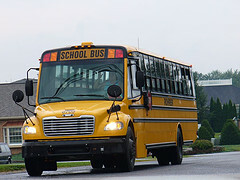 Be aware that yellow flashing lights indicate that the bus is preparing to stop to load or unload children, which means drivers must slow down and prepare to stop. While some accidents cannot be avoided, many pedestrian accidents can be prevented when motorists slow down and pay attention. Every parent wants their child to get to school and back safely, but that means motorists must be attentive around school buses and school zones. The Citrus County Injury Lawyers at Whittel & Melton encourage you to drive safely today and always. If your child has been injured in a pedestrian accident in a school zone or elsewhere in Citrus County, please call us today at 352-726-0078 or contact us online for a free consultation. We can begin assisting you immediately!